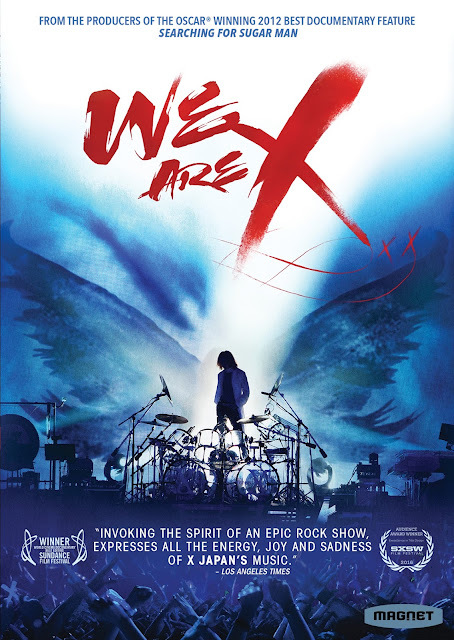 GIVEAWAY: X JAPAN's "WE ARE X" on DVD (USA) | VKH Press – J-Rock & Visual Kei Coverage Worldwide! We have some exciting news for everyone. VKH is giving away X Japan Documentary "WE ARE X" with RESONANCE Media! The giveaway is open from April 25th - May 1st as a promotion for the DVD's U.S. release through Magnet Releasing. The contest will be going on from today, Tuesday, April 25th to the end of the day Monday, May 1st. Two fans will be picked to win a copy of the "WE ARE X" documentary. We will pick one of our followers from our Facebook page and one from our followers on Twitter and each winner will be sent a copy of the documentary! Check out the guidelines below. You can also order a copy or watch the "WE ARE X" documentary on Amazon and iTunes! - Participants must reside in USA. - Participants must be 18 or over. - DVD is Region 1 only. "Silent Jealousy" was the first X Japan song that got me hooked on the band. Back in high school, Dir en grey was about the only Japanese rock I listened to, but I discovered X Japan through the internet. "Silent Jealousy" and the album it came from, "Jealousy" were the moment when I realized just how incredible of a band they are. The first song I heard of theirs was Longing~Togireta Melody. I actually saw it on a VHS recording of the show Pop Jam that my best friend's dad recorded for us while visiting his family in Japan. I loved their style and I was intrigued by the heavy visual sound after discovering the rest of their music through the album Dahlia. For me, they're the perfect mix of visual, classical, and rock! Their music has moved me and I knew I would love them forever. Their music is a bond that cannot be broken. X !! When they played that at MGS I died!! I just really like the way it sounds and the feeling it gives off. Kurenai was the first X japan song I heard. I came across it while listening to orther jrock bands on youtube. The gentle violin and guitar in the beginning captured my heart before I even heard the lyrics, I was instantly hooked.